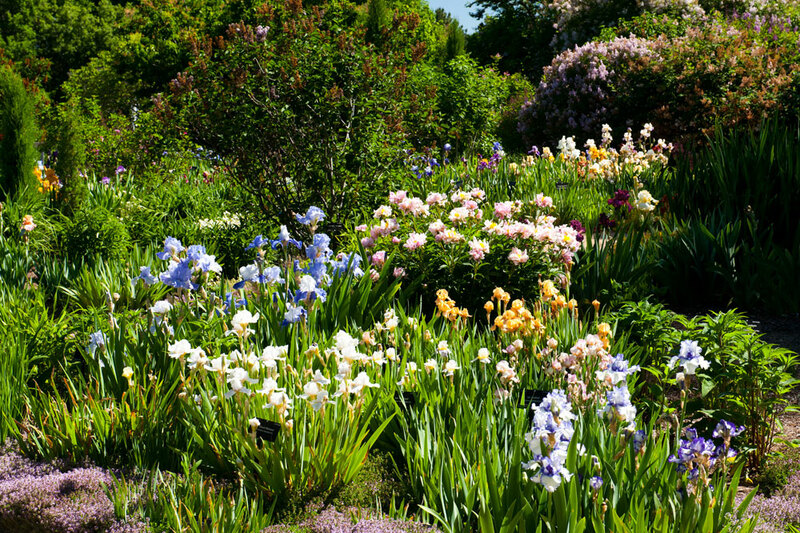 This garden features more than 200 cultivars of iris and 150 cultivars of daylilies interspersed with other spring-blooming bulbs and perennials to create a tapestry of color from early spring through mid-summer. Go to the Gardens Navigator website for more information and a plant list. This display garden of annuals (formerly the All-America Selections Garden) bursts into view with bold, brilliant color. 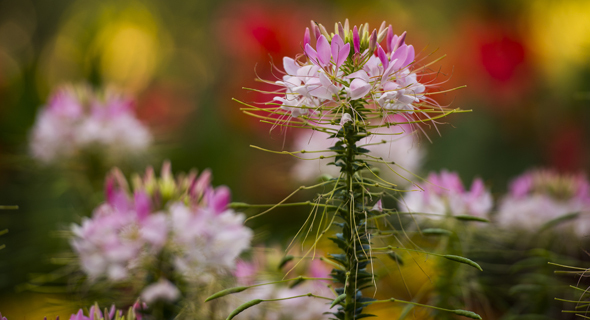 New blooms continually replace old ones as the finest plant introductions in North America demonstrate their vigor. Go to the Gardens Navigator website for more information and a plant list. 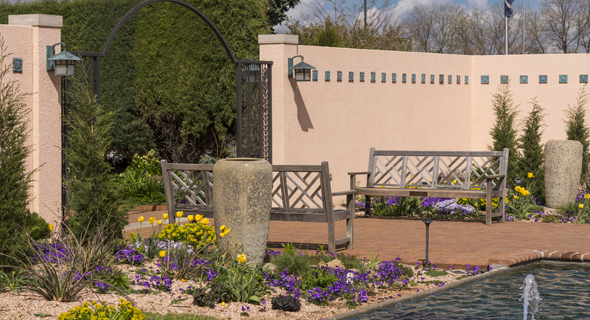 This elegant garden features a stucco wall, brick walkway and long reflecting pool, culminating in a waterfall. The bottlebrush-like flowers of Oriental fountain grass line the pool, while vertical beech trees and blue oat grass soften the border along the wall. 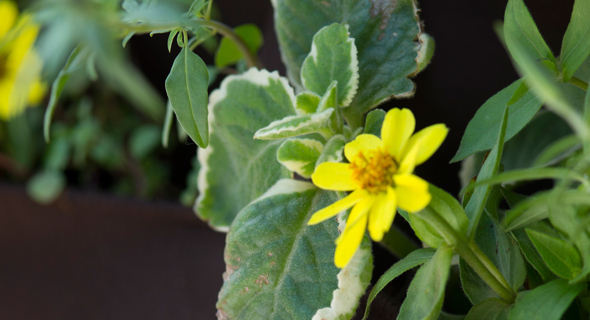 Go to the Gardens Navigator website for more information and a plant list. 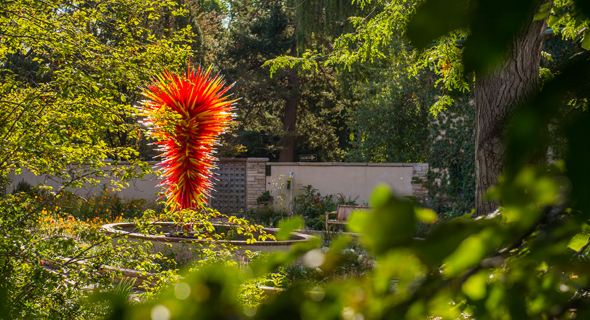 Adjacent to the Romantic Gardens, the Ellipse features roses from May-Bonfils Stanton collection, as well as the Chihuly sculpture, "Colorado." 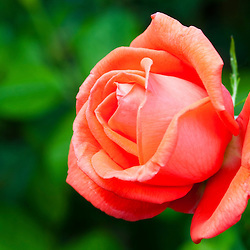 Also on display are hydrangeas, peonies, delphiniums, daylilies and other rose companions. Go to the Gardens Navigator website for more information and a plant list. 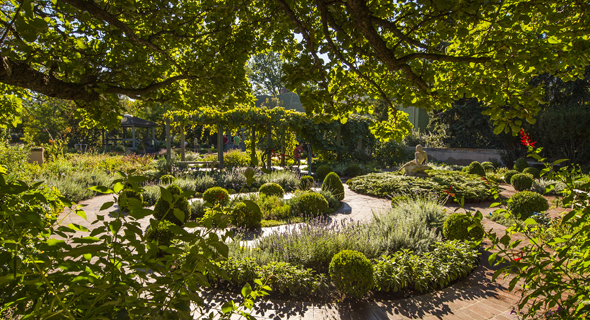 A living potpourri, the Fragrance Garden features aromatic herbs and flowering plants, ranging from heavily perfumed roses to delicately scented mock orange and spicy oregano. Leading out from the plaza is a circular pool that features lotuses and waterlilies. Go to the Gardens Navigator website for more information and a plant list. 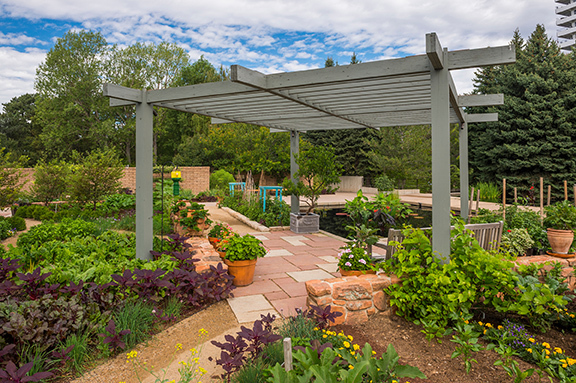 Designed in a traditional European style, with circular, narrow beds at the center, Denver Botanic Gardens Guild helps maintain the herb garden. It features culinary and medicinal herbs from the Middle Ages that are still common today, as well as a sandstone sundial. Go to the Gardens Navigator website for more information and a plant list. 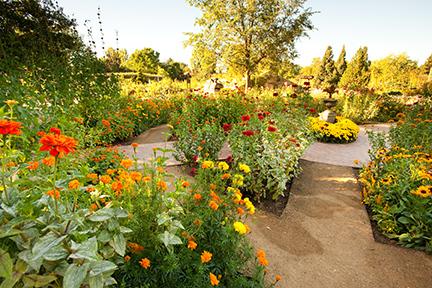 The cutting garden is designed in concentric circles, with fast-growing annuals planted at the center and perennials radiating out to the edges. 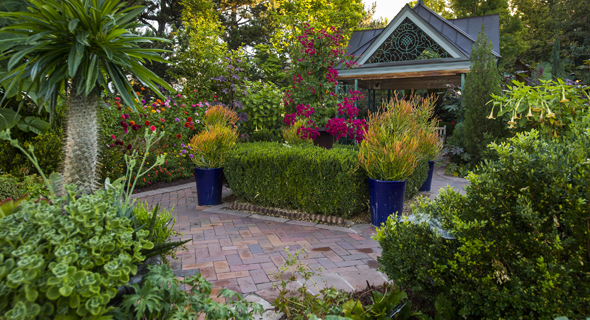 An urn adorns the center of the garden, drawing the eye in, while each bed is assigned a color theme for ease of harvesting. Go to the Gardens Navigator website for more information and a plant list. 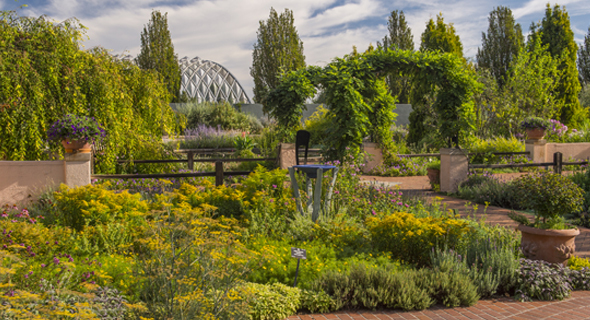 French-style design combines with agriculture in this culinary garden of vegetables, herbs and edible flowers. Lined with a mixture of boxwoods, basils, chives and stone walls, the garden boasts multi-colored vegetables and espaliered apple trees. Go to the Gardens Navigator website for more information and a plant list. 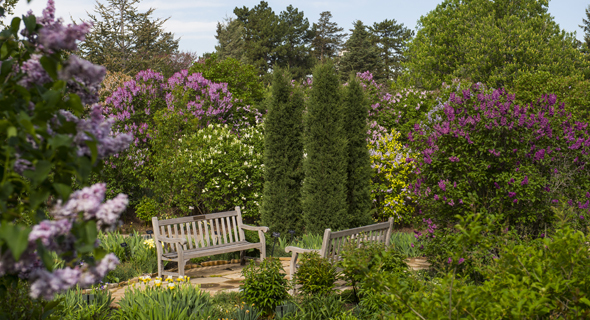 The Lilac Garden features nearly 80 different species and varieties of lilacs and serves as an important tool for collecting phenological data of flowering time to monitor climate change impacts. Go to the Gardens Navigator website for more information and a plant list. The rose collection is now incorporated into the Ellipse and the Romantic Gardens beds. 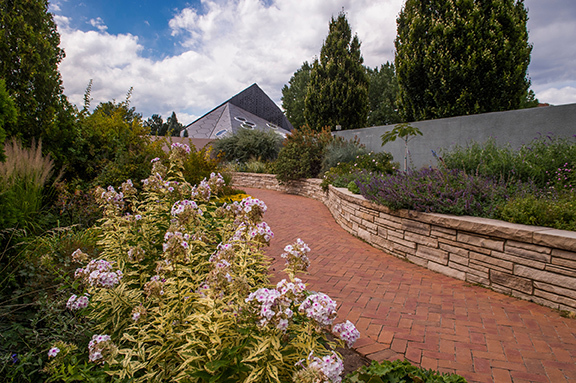 O’Fallon Perennial Walk is a superb place to begin a leisurely stroll through the Gardens. Modeled after European perennial borders, it weaves together a rich variety of perennials of varying colors, heights, shapes and textures. Go to the Gardens Navigator website for more information and a plant list. In keeping with traditional French orangeries, this glass walkway showcases exotic tropicals, Italian cypress and seasonal plantings in custom, Versailles-style planters. It also displays a variety of potted citrus that are moved to the outside terrace during warm months. Go to the Gardens Navigator website for more information and a plant list. Evoking sentiment and privacy, the Fragrance Garden, Schlessman Plaza and El Pomar Waterway were the first gardens at York Street to host outdoor weddings. 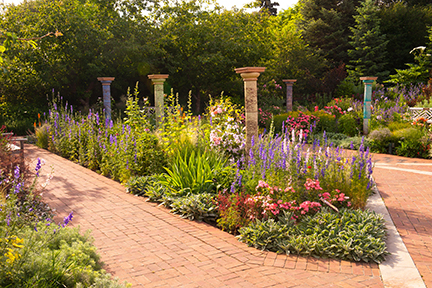 They combine fragrant, lush flowers with graceful walkways, arches, gazebos and columns. Go to the Gardens Navigator website for more information and a plant list. As part of the Romantic Gardens, this plaza offers picturesque settings for weddings and other events. It features twin pavilions, as well as pillars painted in whimsical colors. Go to the Gardens Navigator website for more information and a plant list. 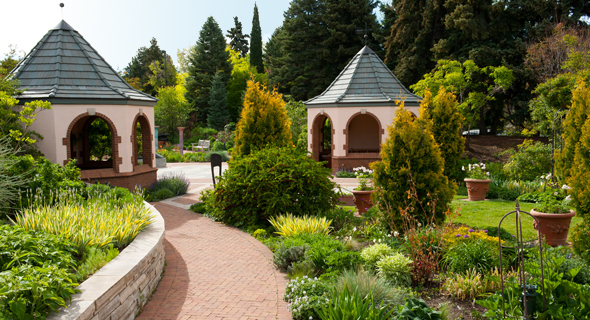 A contemplative space, the Scripture Garden brings together plants originating in the Fertile Crescent, the ancient region of the Middle East associated with Jewish, Christian and Muslim faiths. The plants were selected to symbolize various religious stories and interpretations. Go to the Gardens Navigator website for more information and a plant list. 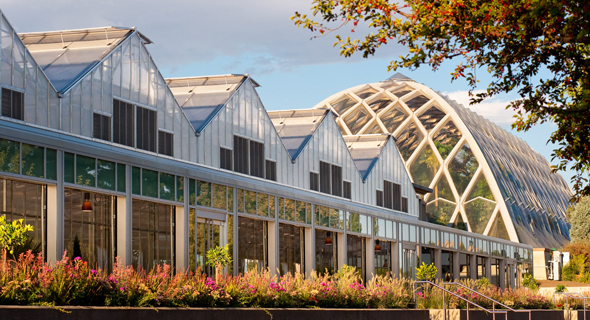 This unique garden utilizes architectural features and sensory plantings to enable people of all ages and abilities to interact with plants. Specialized gardening techniques and structures help to minimize barriers and maximize people’s abilities. Go to the Gardens Navigator website to learn about the green wall in the Sensory Garden. This garden pays homage to Europe’s golden age of plant exploration in the late 1800s, when it was fashionable to create opulent tropical gardens to show off personal wealth and exotic plant collections. 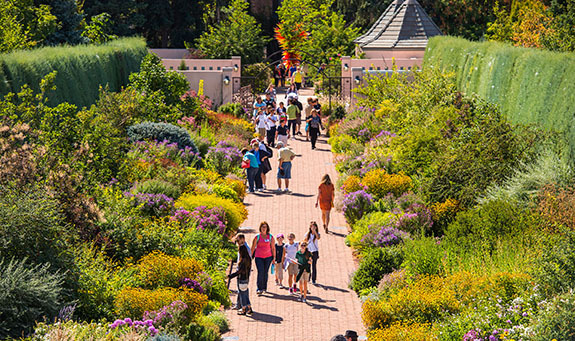 Since Colorado’s climate is arid, this garden uses hardy plants that capture the look of tropicals. Go to the Gardens Navigator website for more information and a plant list.